Way back when, I grew up in a seaside town which sported a funicular railway which ran up a cliff behind the seafront. During a school project on public transport in the town, I wanted to include the funicular, on the basis that it provided transport from housing at the top of the hill, to shops (and the beach) at the bottom. But I was told that the funicular railway wasn’t “proper transport” and that I should restrict myself to trains and buses. I remember being immensely cross, but not having the experience to argue my case. These days, I’m happy to classify everything from funicular railways to moving walkways (via driverless automated metros, travel pods, long-distance escalators, cable-cars and much more besides) as “proper” public transport. And so do other people (for instance here and here), who are increasingly recognising that these non-traditional modes of public transport are just the job for tackling short distance transport challenges, particularly the ‘final mile problem’: getting passengers from the final railway station or bus stop on their journey, to somewhere closer to their actual destination. You can even go to seminars on the subject. One short distance transport challenge is moving people vertically. For that, you (usually) need escalators or elevators. Elevators don’t just have to be in shops, you know. The Isle of Wight (a small island off the south coast of the United Kingdom) might not be the first place that springs to mind for radical transport solutions in urban areas, but the seaside town of Shanklin installed a freestanding elevator in 1891 or 1892 (sources disagree) to bridge the vertical gap between the beach and the town, the majority of the latter being on top of hills behind the seafront. It’s real public transport. You have to pay fares and everything, though it runs on demand rather than to a timetable. 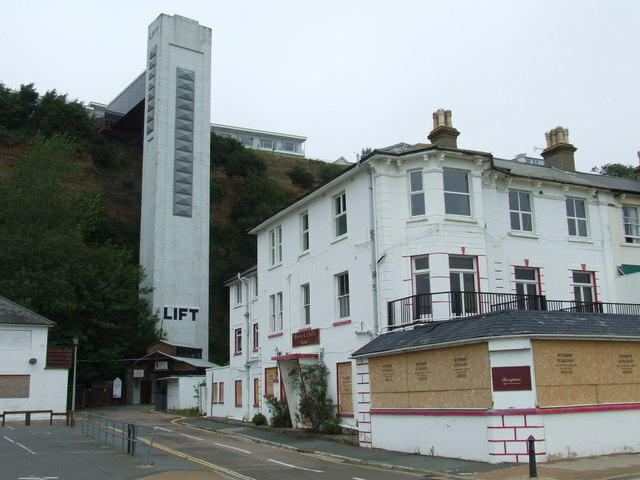 The original lift (which had an alarming-looking framework structure as you can see here) was replaced in the late 1950s / early 1960s with the current lift. It looks more substantial, but I’m afraid it’s not very beautiful. Nevertheless, a select few elevators are jaw-droppingly attractive, and this week we’re turning our attention to one in the German capital Berlin. The AquaDom, Radisson Blu Hotel, Berlin, Germany. By Eric Pancer [CC-BY-3.0],via Wikipedia. Yes, your eyes do not deceive you. 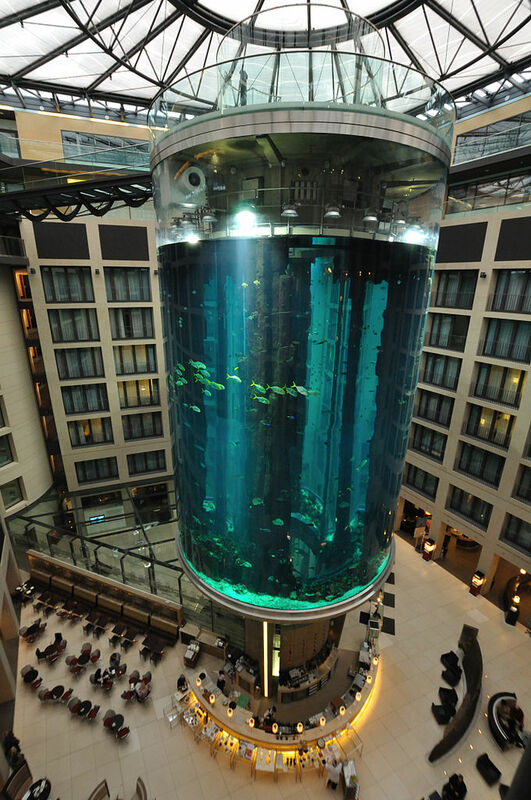 It is an elevator contained within a giant fish tank. Well, it’s an aquarium to be honest, containing over 2,000 fish, and its proper name is the AquaDom. Measuring a staggering 25 metres tall (that’s the elevator anyway; the actual aquarium is some 16m in height), and 11m across, it contains some 1,000,000 litres of salt water. The AquaDom was designed and constructed by specialist aquarium company International Concept Management of Colorado, USA, and opened in 2004. They say it’s the world’s largest cylindrical aquarium and holds approximately 100 different fish species, not to mention a variety of corals. At the top, natural daylight can make its way in, which is good for the aquarium’s inhabitants. The tank is made not of glass, but of acrylic, fabricated by Reynolds Polymer Technology, also of Colorado, USA (which I assume isn’t a complete coincidence and that the two companies must have come across each other before). The outer column was made of four pieces and constructed on site, while the inner core for the elevator arrived as one single enormous piece (you can read more about it here). On the ground floor of the Radisson Blu Hotel, in the atrium, is the hotel’s Lobby Lounge and Bar, over which the AquaDom towers. This makes it one of the few locations in the world where you might specifically wish to eat and drink at the bottom of a lift shaft. At the top of the hotel is the DomLounge, a meeting and events facility, and it is to serve the transport requirement to whisk people quickly between one and the other that this elevator was built. Lucky visitors to the DomLounge ascend there in the elevator that runs through the core of the AquaDom. This must be a bit like being a James Bond villain with a secret headquarters hidden underwater in what appears to be an aquarium. Although if you actually were a James Bond villain, your aquarium would contain carnivorous sharks for you to feed James Bond to, assuming he didn’t escape first. On their way up through the AquaDom, visitors might catch a glance of the scuba divers who are retained to look after the aquarium and keep it clean. It’s a good job there aren’t any carnivorous sharks in there, then. It only goes to show that any piece of transport infrastructure, no matter how short the journeys it facilitates are, can enhance the environment in which it is located. Well, I don’t know about you, but direct trains from London to Germany can’t start soon enough for me (come on DB, get your act together), so that I can have a ride through the AquaDom. For legitimate business purposes, you understand. Regular reader PD of Surrey (hello!) suggested I take a look at the AquaDom, so I did. I like getting suggestions. If there’s something you think I should be covering, then why not drop me a line? You can find contact details on the “contact the author” tab near the top of the page.